Health care providers are migrating their systems to incorporate Health Information Technology (HIT), which allows providers to electronically input and store patient data. Many organizations serving AA&NHOPI populations do not have a method that uses HIT to determine if non-clinical services or enabling services (i.e., interpretation, transportation, etc.) 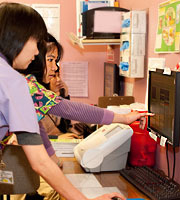 improve patient health outcomes. AAPCHO develops programs that help community health centers more effectively collect and store patient data and determine if enabling services , non-clinical services, improves patient health.